Anyone who has run SME meetings using Cathy Moore’s action mapping model or plans to to so after reading her blog, will have discovered that it is the clearest of models, but not as easy to implement as it seems. It requires some experience and techniques to guide your SME team to the core of what their training needs are. What do they want to see happen after the training? How can that be expressed in a measurable goal, which behaviours are needed to achieve that goal, and can these behaviours actually be trained? When I was recently asked to help other instructional designers to learn how to run those meetings and apply the model, it was one of those instances when you suddenly have to analyse how you do something that almost comes natural to you after a while. In short, I had to action map my own action mapping meetings to understand what instructional designers actually need to do to build a solid action map with their SME’s! So this is what I came up with as a meeting structure I seem to follow. First, the ID needs to explain the basics of action mapping to the group, especially if the group is new to it or used to the ‘old’ content-based approach. You may have to provide some evidence ‘that it works’ and make clear how you are not starting from content. “I want to understand their problem thoroughly first”, helps and flows into the next ‘part’ of the meeting. That stage is all about building rapport with the SME group. It is very important that they feel you are interested in their subject, their daily work, their issues they need to solve. Invite them to tell you about it, unstructured. Why do they think they need training, how do things work on their floor, tell me some stories of what happens, what do you see? Empathise, use active listening skills – I expand on that a bit further in this post. Even though this is an unstructured part, it already opens views for you as the ID. You hear stories from the floor which may come into the training later as a base for scenarios, you hear about unwanted behaviour that causes bad consequences you can use to in your scenarios too. Do not hesitate to jot down things here because the conversation is already contributing to your final action map. Pick up cues during that conversation of what they are exactly aiming for. Use these cues to guide the conversation to the next phase, where you define a measurable goal. This can be quite hard sometimes, especially if your training is about soft skills or people mix up behaviours with goals. To help with that I designed a bunch of cue cards that I am in the process of perfecting. I hope to share them with the community soon. Try to tease out numbers, timeframes, narrow down the goal or split it up when it seems to wide. Narrow down the target of the required change, e.g. which employees exactly or what kind of incidents, which specific actions need to increase, decrease or reach a certain target and by when? Determine with the group how that goal will measured – what is the evidence? Are there regular figures, reports, meetings or will it be anecdotal? 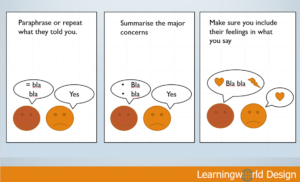 Quite often this part of the conversation will already bring up behaviours, the next stage – start placing them where these would be on your action map. From the measurable goal, the group then needs to list the behaviours that are wished for, and unwished for (that need to be changed or eliminated) to achieve the goal. The SME can tell you stories, vent frustrations about behaviours, they can show forms/paperwork used, explain procedures etc. All this contributes to your full understanding as an ID and gives you a view of the learning world you will create. Some behaviours will be linked in processes, others stand by themselves, and some will have to be ‘shot down’, i.e. they can not be solved by training. The system is broken, the procedure is flawed or there is an organisational culture issue – training is not the solution. One of my most memorable examples is a SME group who listed as an unwanted behaviour the limited English skills of their target group (6000 seasonal workers!). For them it was the main reason their existing training did not work. It was certainly a problem, as they tried to train purely by words, but it was not a ‘behaviour’ they could change by training, unless they invested in massive English courses each season before even training people for the daily floor work! However, let’s return to active listening skills briefly. I recently worked on a course that included teaching of active listening skills to help young people talk to their friends in emotional need – and I noticed how many of these techniques are crucial in a SME meeting. First of all, active listening implies that you are actually listening, not formulating replies in our head. It is quite amazing how many of us do this in conversations. It’s like we are often just waiting for our turn to speak. During the conversation, here are some things you can do to listen ‘actively’: paraphrase or repeat what people told you: “so, what I am hearing is…”, “If I understand it correctly, people need to do … to achieve …”, to show them you listened and to make sure you have registered correctly. Summarise the major concerns you hear: “Am I right in saying that the main problem seems to be ….”, “So if training could achieve … that would already be a great help to you?”. Include feelings in what you say. “It must be very frustrating for you to have to correct all these forms time after time, let’s see if we can help you”. There will be a moment when the stories ‘dry up’ everything seems to be said or is now repeated. Time to wrap up things and start planning. Who will be your main SME contact? How will you plan regular meetings to work collaboratively on the course? What do you expect from them in terms of helping write realistic scenarios and providing job aids? Who needs to approve the time they will spend working on their course with you? So what about the design document, I hear some of you ask. Personally I do not believe in enormous reports and design documents to follow the meeting. My document mostly contains a cleaned-up action map (don’t forget to make a picture of the whiteboard if you used that!). Mindmapping software works well. I elaborate on the measurable goal and behaviours in a short text and make sure to include the concerns that led the SME group to look for a training solution. I suggest my first ideas for the course (I see a nurse going through her day and she encounters x and y, or a see a detective story where the leaner has to discover clues on y and z, I suggest x as a possible practice activity for this skill …) and scenario-ideas I picked up in the meeting. 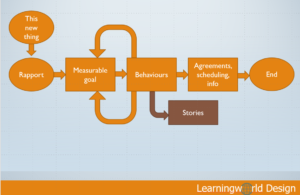 If you want to read more advice on this subject, this excellent blog post from Norman Lamont who describes his process from action mapping to e-learning. ← Can the learner journey be the learning outcome?